CATcerto was the brainchild of Lithuanian conductor, composer and artist Mindaugas Piečaitis. Mr. Piečaitis contacted Burnell & Betsy about his idea to write a concerto inspired by my playing after he watched my videos on YouTube. 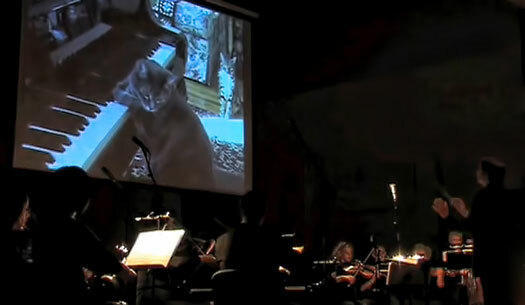 The world premiere of CATcerto was performed by Klaipėda Chamber Orchestra in the Klaipėda Concert Hall in Klaipėda (Lithuania) on 5th June, 2009. Mr. Piečaitis conducted, and I appeared as guest soloist via pre-recorded video projected onto a large screen behind the orchestra. The piece, including video of yours truly, was subsequently published by Peters Publishing and has been performed by numerous orchestras around the world, to the delight of audience members of all ages. 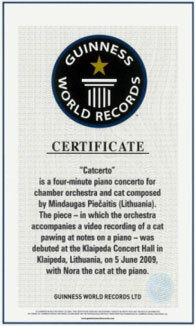 In 2010, CATcerto received an award from Guinness World Records for being the first concerto ever written for a cat. It will appear in the 2012 edition, scheduled for publication in September of 2011. Below is a list of past & future performances of CATcerto. Conductor: Mindaugas Piečaitis – Lithuania. Original performance. Conductor: Allen Feinstein – USA. Conductor: Mindaugas Piečaitis – Lithuania. Conductor: Robert Gutter – USA. 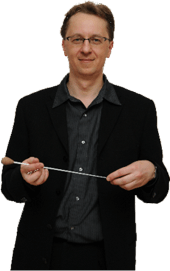 Conductor: Neal Farwell – UK. Conductor: Richard Rosenberg – USA. Conductor: David L. Crane – Chicago, IL USA. Conductor: David Rutherford – Denver, Colorado USA. Conductor: Michael Schónwandt – Netherlands. Do you play piano? Read music? Would you like to be able to play the Main Themes from CATcerto? Well, Mindaugas Piečaitis has made available the sheet music for CATcerto’s Main Themes arranged for piano in downloadable PDF format (111 k). And it’s FREE!